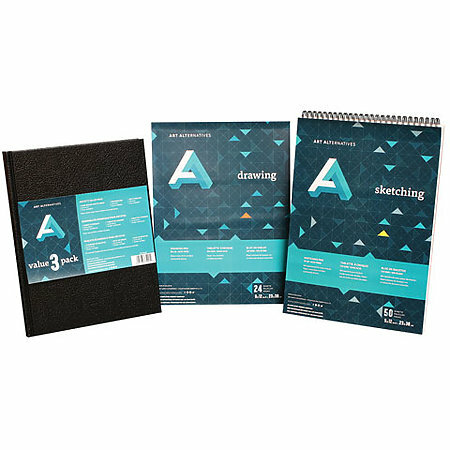 This special value-pack includes three great surfaces that are great for sketching, drawing and writing in any dry media. The set includes an 8.5" x 11" hard-bound sketch book with 110 sheets (220 pages) of 75 lb. (110 gsm) paper, a 9" x 12" tape-bound drawing pad with 24 sheets of 90 lb. (135 gsm) paper and a 9" x 12" wire-bound sketching pad with 50 sheets of 75 lb. (110 gsm) paper. The paper is acid-free, bright white and sourced from certified sustainable forests. Ideal for use in the studio, classroom or on the go.